- 【Environmental Protection Materials TPE Made Fitness Trackers Strap】TPE combines the advantages of both rubber and ABS.It is high strength, high elasticity, anti-fall, tensile, non-toxic, hypoallergenic, waterproof and breathable. 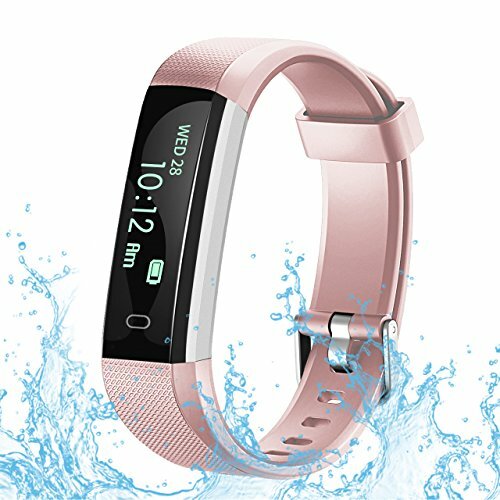 Meet your diverse sports needs:U2 Fitness Tracker bracelet reaches international IP67.It is waterproof,dustproof,no bothering after sweating.You can wear it in cold water,just enjoy swimming or other water sports.shopping with us now with 10%OFF Limited Time. - 【Upgraded App"VeryfitPro"】Solved Problems that cannot be scanned, improved the stability.Main Activites functions divided to exercise detection,sleep monitor and analysis,heart rate monitor(U2 Activity Tracker Haven't This Function ) movement Map track,timeline,sports leaderboards, call reminders, SMS,SNS notification and display, clock alarm, Calories burnt etc.compatible with android 4.4 or above, iOS 7.1 or above. - 【USB Charging Interface&Low-Power OLED Screen Equipped】 You can use computer USB port,Ipad and smart phone charger USB slot to charge, or even USB car charger for direct charge, fast and convenient. Last 5-10 working days after fully charged. Touch the screen lightly, and real time data such as time, steps, and heat consumption will be immediately presented.Screen bright once lift your wrist. - 【Manufactured with High Quality and High Standards】 RobotsDeal Brand team have many development patents and design Patent in fitness track,smart watch.U2 Fitness tracker passed CE, RoHS, FCC and other European and American high standard certifications.The RobotsDeal brand is only Authorized to VaporStroe stores.Any sold from other stores,product authentity cannot be guaranteed and cannot enjoy the warranty service of "RobotsDeal" brand. - 【45 Days Money Back & 18-Month Warranty】RobotsDeal has been dedicated to produce Fitness Tracker for many years, and we have a professional team of experts in this area. RobotsDeal not only gives you attractive & stylish look, but also provide IP67 waterproof protection and richer bass to meet your practical needs.RobotsDeal U2 fitness trackers guarantee 45 days money back & 18-month warranty.